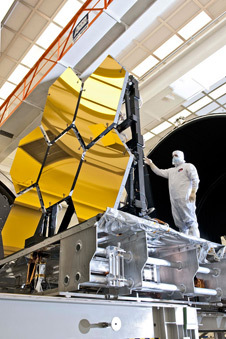 The James Webb Space Telescope (JWST) has just had its mirrors coated in a super thin layer of gold - Read More About It http://www.nasa.gov/topics/technology/features/webb-mirror-coating.html. And it appears that Congress will let JWST fly in 2018 instead of cancelling Hubble Space Telescope's successor. This is VERY good news as billions have been spent developing JWST and new technology.